What if what we were told of 9/11 was a total lie? What if what we saw with our eyes on television that black Tuesday was a carefully planned illusion? Maybe the world was being deceived and purposely moved in a certain direction for the evil purpose of planting the seeds of WAR? The X-Files spinoff series, 'The Lone Gunmen,' had its pilot episode concerned with a federally-sanctioned/terrorist plot to fly an airplane by remote-control into the World Trade Center! The pilot was written by Chris Carter, Vince Gilligan, John Shiban and Frank Spotnitz. These were real terrorist acts planned by the American Joint Chief of Staff against its own population. Christopher Bollyn of the American Free Press reported the following in an article called '9/11 - What Did Rupert Murdoch Know?' More than a year before 9/11, media mogul and owner of Fox-TV, Rupert Murdoch produced a television program that depicted a passenger aircraft being remote-controlled and flown into the World Trade Center. Did he have prior knowledge of 9/11? Murdoch is said to be television's most powerful man in the world with the capacity to reach more than 110 million viewers across four continents. Murdoch is a close friend of 'accused Israeli war criminal' and PM Ariel Sharon. An estimated 13.2 million Fox TV viewers watched the pilot episode of TLG broadcast on 3/4/01. When life imitated art just six months later on 9/11, no one in the media seemed to recall the program. Why was it so forgotten? The Lone Gunmen (Frohike, Langly and Byers) attend the funeral for John Byer's father. The report was that he died in a car crash. TLG are lead to believe he was murdered for what he knew. The wreck was staged to appear as an accident. They search for clues in Byer's father's apartment and find information on computer files. Later, Langly speaks to a fellow hacker to help him break through a D.O.D. encryption. The Lone Gunmen meet Yves Adele Harlow who becomes a regular on the show. Her name is an anagram for Lee Harvey Oswald. The episode refers to JFK or there is an implication of that era three different times. TLG find a computer chip in Byer's father's crashed car. It is an 'integrated antenna' that can remote-control the car. Later, the Gunmen put the clues together and hack through the encrypted files. Their hacking is suddenly discovered and traced by the feds. Later, the agent again meets with the Lone Gunmen. John Byers discovers that his father is alive! They encounter each other in his apartment. It was his father who faked his own death. This was so the feds (something called OVERLORD) would not be after him any more because of the big secret he had found. BYERS: 'We would.' (The Lone Gunmen). In the story, father and son board the very plane that they believe will be federally taken over by remote-control. OVERLORD agents monitor both Byers on the plane. Langly hacks into the flight control system output and communicates with Byers. The pilots eventually listen to Mr. Byers and turn off the Auto-Pilot. They find that they do not have control of the airplane. [There are scenes, amazing aerial-camera-shots, of New York at night. The camera is mounted on front of the plane and we viewers see the large 727 heading for the Twin Towers! From the viewer's P.O.V., we are flying directly into the WTC at night. Eerie, shocking, bizarre and other adjectives can describe the FEELING we have seeing this and KNOWING what is going to happen 6 months and a week after the episode's airdate]. The Lone Gunmen hack through the remote-control and regain manual override just in time. The disaster of a domestic airlines crashing into the World Trade Center has been averted. Father and son talk after the near tragedy. Does this writer believe TLG pilot episode was PROPHECY? No, that was to get your attention. Was this a sheer COINCIDENCE? Most people, when made aware of the foreshadowing episode, would think it was just a quirk of fate. How odd... But, what if it was not a coincidence? What if everything is connected and conspiracies are truly everywhere? Then: Why did THEY air to the masses, to millions of the viewing public, their real life intentions of bringing down the Towers? Knowing Murdoch's connections, knowing how secret societies control the world, this writer does not put anything passed the rulers who operate from the darkness. The film 'Pearl Harbor' was playing in theaters when the WTC fell and that was NOT a coincidence. THEY move us to war by subtle manipulation. The weak-minded march to war and the strong fight against the brainwashing. Read my article called 'The Great 9/11 Magick Trick.' There are underground documentaries such as 'In Plane Site,' '9/11 The Great Illusion' and 'Painful Deceptions' to only mention a few. These controversial sources provide evidence that our dear authorities, the ones we pay our taxes to, did indeed crash two unmanned (radio-controlled) planes into the World Trade Center on 9/11. The guilty parties were not Middle-East terrorists. The true monsters behind it were far closer to home. (Write to me at dugko@surfside.net and I'll tell you how to obtain these shocking documentaries). My view is that The Lone Gunmen's glimpse into what will happen to the Towers was not a coincidence. That is what THEY do. They shove their fascism, their power over us, in our face and expect us to take it with a smile. Just the fact that the show involved the WTC...the weapon of destruction was the airlines...and that the story involved REMOTE-CONTROL is simply amazing! Few people understand that the media's purpose is LIES AND DECEPTION. Remote-control, computer-guidance systems brought a grey/windowless and EMPTY plane crashing into the second Tower. The REAL 9/11 plane, filled with passengers, was rerouted and landed in Ohio stated one news report. We can only imagine the dark fate of those 9/11 passengers who safely LANDED. No plane struck the Pentagon, that Tuesday morning, and the plane in Pennsylvania was shot down like Flight 800. There is only one terrorist in town. At least, The Lone Gunmen's pilot episode pointed the finger at the real terrorists: US. Who profits from arming the world and spreading chaos? We do. Who are the only ones with Weapons of Mass Destruction? We are. Other countries have the Bomb because WE gave it to them. Another oddity that should not be ignored is the numerous references to the Kennedy assassination in this particular pilot episode. Why? Could it be, back in 1963, that was another terrorist act perpetrated by our Shadow Government and not some bogus patsy or scapegoat? The Lone Gunmen pilot episode aired in Australia less than two weeks before 9/11. The cancellation of TLG is considered to be somewhat mysterious, as its ratings were in fact higher than the first season of the X-Files. 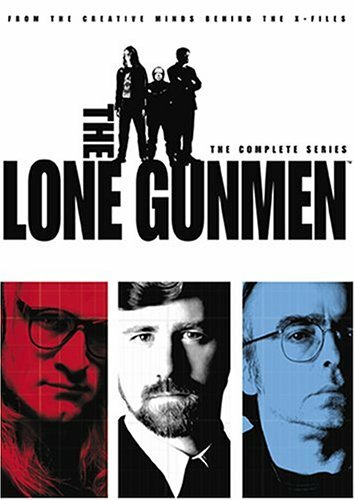 DVD sales of The Lone Gunmen are high because of the prophetic pilot. The actor who played John Byers' father is George Coe. Coincidently, he also played the character of Ben Cheviot, the head of Network 23 on the series Max Headroom. 'Max...' was another short-lived series that may have gotten the axe because of its controversial subjects. My memory of the pilot Lone Gunmen episode, I thought, had to do with a water-engine automobile. This was one of their episodes entitled 'Like Water For Octane.' Was the episode substituted for the real pilot, not aired in my area? Who knows? We, the audience, are naive and believe that these expose shows are really uncovering some truths in primetime. Do not believe that for a second. The X-Files, Lone Gunmen, Discovery Channel, History Channel, etc., reveal nothing that THEY do not want you to know. Television, movies, the news, the newspapers are not going expose the truth or any real secrets. Instead, they are part of a much larger problem. There is an OVERLORD and they ruthlessly rule the world. PS: On the subject of Chris Carter's 'The X-Files,' who says the popular and successful television series exposed any truths/secrets at all? There are certainly real world facts to support ideas such as Super Soldiers, ancient aliens, present aliens, governments working with aliens, alien virus/cure, alien technology, saucers, a secret 'Syndicate' elite and a host of other themes that were a part of the primetime show. The question is: Was The X-Files an expose or a part of the UFO cover-up and propaganda? Was it disinformation, on a weekly basis, over the airwaves for 9 years? A clue could be contained in a particular episode where David Duchovny as Mulder talks about the Alien Autopsy. He says to Scully, 'you know, that bogus Alien Autopsy that the Fox Network aired.' Now, what's wrong with this picture? Whether the AA is credible or not, it was out of character for Fox Mulder to have been the skeptic. If anyone would have been open to the Autopsy's reality, it would have been Mulder. Subtle manipulation for the masses to NEVER believe such a thing? There were episodes that dealt with the American government mass-murdering and secretly getting away with it. Then, like clockwork, someone would come in with a comment saying 'the government wouldn't DO that.' It has to be some 'Shadow Government,' a 'small faction,' a 'rogue' group within the government that are the guilty parties and the ones responsible for the destruction. It is not the whole Government that is bad, just this small part over there (yeah, the few who control everything). What were show's catch phrases? If we were not dealing with the Monster-of-the-Week, then The X-Files was concerned with their overall story of the alien agenda and the human Syndicate. Featuring the Cigarette-Smoking-Man, these were primarily men who operated unrestrained at the highest levels of power. They were government officials, wealthy businessmen and an alien or two in human disguise. Does an omniscient elite rule the world? Is there some real world truth to MAGNETITE being the Super Soldier's kryptonite? Is their Achilles' heel in the back of the neck? Does the 'black oil' virus have a parallel in the real world? In this writer's opinion The X-Files and spin-off show, The Lone Gunmen, were a part of the problem and not a part of the solution. Special information or disinformation? The answer must be disinformation. In the same way that some UFO organizations have been infiltrated by government agents, so are the airwaves federally sanctioned and approved. The Government owns the media. THEY will not allow any would-be Lone Gunmen to air federal, dirty laundry to the masses. Media is never going to really criticize the government, like a TV show will never really criticize their sponsor. I believe the idea (of primetime) is to tease and intrigue you with the secret truth...then, at the end, dovetail you away from that truth. The UFO enthusiasts LOVED The X-Files, at first, and I'm sure many still do. But the more you scrutinize something, the more you discover what you thought was true...is not anymore. The following is another excerpt from The Lone Gunmen series, an episode called 'Like Water For Octane.' The story concerned the suppression of a water-powered, car engine. WATER-ENGINES are not just a fictional fabrication. They have been purposely NOT developed in the real world. Look up their underground history. (See the film 'The Water-Engine' with William H. Macy). At the end of the story, the threatening agent is stopped and the Gunmen help suppress the water-car. Jimmy Bond, the 4th Gunmen, narrates the final scene as Frohike takes a wonderful joyride. In these days of super-high gas prices, we are DYING for a water-engine...or hovercrafts. Why this TLG argument falls flat is the water-engine is POLLUTION-FREE and environmentally safe. Also, there are alternatives like NATURAL and PLENTIFUL HEMP SEED OIL that could perfectly fit the bill as an alternative to ALL OUR OIL NEEDS! That fact is not readily broadcasted over the Oil Company-owned media. We choose not to change to better alternatives because THEY are in control and keep certain facts from us...for reasons of PROFIT. We, the people. are not in control. THEY are and they use entertainment, films, TV, etc. to maintain their control over the masses. Do you think it's a coincidence that Mulder was given the name FOX on the Fox Network? The character was their puppet from the beginning. How dare THEY justify the non-use and non-marketing of a water-engine in TLG episode?! And, it's the GOV. AGENT who essentially is the progressive, forward-thinker by wanting to develop it? How's that for an evil twist? Do you really want to argue against this being PROGRAMMING?